(Newtown, PA– February 18, 2016) – CenTrak announced it has received the Innovative Technology designation from Vizient, Inc.,the largest member-owned healthcare company in the country. The designation was based on reviews of CenTrak’s Enterprise Location Services offering by hospital experts who attended Vizient’s Innovative Technology Expo in November. The annual event provides medical technology suppliers the opportunity to demonstrate their products and gain direct feedback from onsite clinical experts and healthcare providers on the impact the products may have on improving clinical care, safety, or benefits to an organization’s care and business model. Vizient’s Innovative Technology Expo attendees reviewed CenTrak’s Enterprise Location Services which leverage six different technologies to address healthcare’s hierarchy of location requirements, including Wi-Fi, active RFID, Gen2IR, Low Frequency, BLE (Bluetooth Low Energy), and passive RFID. Each technology plays an important role in satisfying the dozens of use cases supported by CenTrak’s visibility platform. The offering is tethered by the industry’s only Clinical-Grade RTLS™ capable of addressing workflow use cases that impact the patient experience. 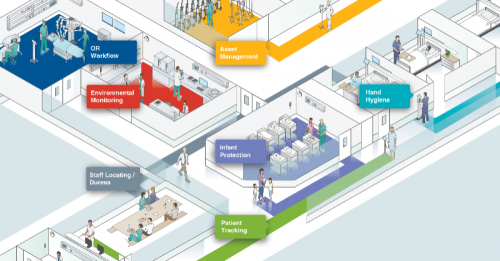 Clinical-Grade RTLS delivers certainty-based location with the capability of segmenting locations into clinically relevant spaces such as patient rooms, beds, bays, chairs, nursing stations, hallway segments, choke-points and dispensers. In addition, Clinical-Grade RTLS provides rapid location updates capable of capturing interactions between equipment, patients, and staff within a few seconds and facilitates the collection of clinical milestones. “Vizient is committed to providing our members with leading-edge technologies that deliver new clinical and operational benefits from what is currently available in the market today,” said Debbie Archer, director of procurement and leader of the Innovative Technology program for suppliers. “After reviewing CenTrak’s Enterprise Location Services at our annual Innovative Technology Expo, the hospital experts who attended agreed the product offers unique and incremental benefit over other products available on the market today, and recommended it for the Innovative Technology designation. Vizient is the new brand identity for the organizations formerly known as VHA Inc., UHC, and Novation. Since 2003, more than 2000 new and innovative products and technologies have been submitted through the Vizient Innovative Technology program. Vizient works with member-led councils and task forces to identify and review potentially innovative products. If it is determined that a product is innovative, a contract may be awarded outside of Vizient’s competitive bid cycle. To learn more about Vizient’s Innovative Technology program, visit www.novationco.com/expertise/technology.